Whisk together flour, baking soda, baking powder and salt in a large bowl. In another large bowl, with an electric mixer, cream together butter and sugar until light and fluffy. This will take about 4 minutes. Add the eggs, one at a time, beating well after each addition. Add the vanilla and sour cream, mixing on low speed until combined. Add the dry ingredients, and beat at low speed until combined. Divide dough into two pieces, and shape into rectangles about 1 1/2 inches thick. Wrap in plastic wrap, and chill for at least 2 hours or overnight. Preheat oven to 350 degrees. Roll dough to 1/4-inch thickness. Shape and cut cookies, and place on parchment-lined cookie sheets. Bake 8 to 10 minutes or until cookies are just slightly golden around the edges. Don’t over-bake if you want soft cookies. 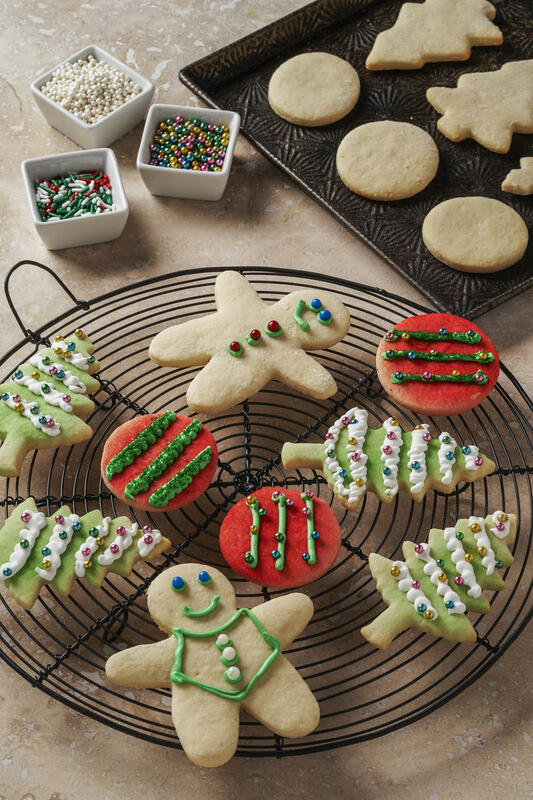 Transfer cookies to a rack, and let cool. Let cookies cool before frosting.